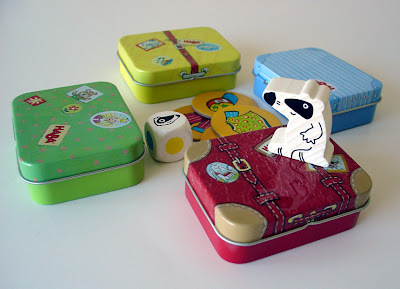 It's made by the German toy company, Haba, and I'm in love with the metal suitcases and the cheeky wooden Badger. The game involves packing for a trip in the midst of reoccurring badger attacks, wherein said badger dumps out a suitcase at your feet and you have to repack the clothes. A rather surreal scenario, I must admit, unless sneaky badger attacks on unattended luggage is common in Germany. But we all love yelling "BADGER!!" when the little badger face turns up on the die. And, again, those little metal suitcases are the cutest!